Grief can be channeled into a powerful force for good in the world. In fact, history shows that the way people react to life’s obstacles can have an immense impact. Mark Nepo, author of MORE TOGETHER THAN ALONE, shares how Lorenzo de’Medici overcame the loss of his father to become a patron of the Renaissance. Your father can build a church that you grow up praying in. You can watch the children of your friends and enemies come of age there. And one day, while praying with your eyes closed, you can be stabbed in that same church. While bleeding, you can watch your brother die. In the starkness of your grief, you can hang those who betrayed you. And you can begin again, trying to make sense of a world where we can be killed where we pray. You can carry the loss around for years like a pill you’re supposed to take but don’t. Until one day, you swallow it all and open your home to the greatest minds of your time. You can seek out the greatest artists you can find and bring them home to live with you, and give them everything so they might build a better world. This is the story of Lorenzo de’ Medici (1449–1492) of Florence, who seeded the Renaissance, that 200-year expansion of mind and heart that changed the world. His great lesson is that we don’t have to become what is done to us. His great warning is that we’re always capable of both, of destroying the world out of vengeance and of creating a new world out of loss. Lorenzo’s great-grandfather was born in poverty and started a bank. After two generations, the Medici family was among the wealthiest in Europe. As a boy, Lorenzo was tutored by the humanist Marsilio Ficino (1433–1499). When his father died in 1469, Lorenzo, at the age of 20, became the head of the family and all its affairs. With the pope’s support, rival papal bankers in Florence began to plot against the Medici family. And so, the Pazzi conspiracy was set in motion. On Sunday, April 26, 1478, during High Mass at the Duomo Cathedral in Florence, the Medici brothers were attacked before a crowd of 10,000. Giuliano, who was 25, was stabbed nineteen times by Bernardo di Bandino Baroncelli and Francesco de’ Pazzi. As his brother bled to death on the cathedral floor, Lorenzo escaped with serious wounds. The assassins were caught and within the hour, 120 conspirators were captured, and, at Lorenzo’s command, eighty were hanged. Jacopo de’ Pazzi was tossed from a window. From the crowd, a 27-year-old Leonardo da Vinci sketched the hanged conspirator Baroncelli. The horrific loss had Lorenzo re-examine what to do with his life and his wealth. He discovered that the journey is both grace-filled and bloody. But how we respond to brutality is what saves the world. At the time of the Pazzi conspiracy, the Renaissance was beginning to bloom, though many Florentines were opposed to the progressive trends of humanism. At this turning point in history, Lorenzo’s grief led him to use his wealth and power to protect the artists and thinkers of the time and support their work, in hopes that they might create a better world. And so, in 1488, the Medici Circle was created, becoming the first art school in Europe. More than a formal school, the Medici Circle was a crucible of innovation and dialogue. Lorenzo used his own collection of art for students to study while maintaining an open house where philosophers, writers, and artists were free to come and live and work. He went to great lengths to purchase Greek and Latin manuscripts and have them copied. His brilliant literary circle included Angelo Poliziano, Marsilio Ficino, Luigi Pulci, and the genius Giovanni Pico della Mirandola. Pico was at the heart of the Medici Circle. At 23, he spoke sixteen languages and proposed a conference to explore the unity of religion, philosophy, nature, and magic, for which he wrote nine hundred theses. These essays formed his Oration on the Dignity of Man (completed 1486, published 1496). The Medici Circle included artists such as Botticelli, Leonardo da Vinci, and Michelangelo, who, at fourteen, came to live and work in Lorenzo’s sculpture school. Other Renaissance artists included Ghirlandaio, Verrocchio, Vasari, Volterra, and Raphael. The innovation of the Medici Circle led Europe out of the Middle Ages. In 37 years of patronage and public service, during and after his lifetime, Lorenzo the Magnificent, as he was known, and his estate spent more than 663,000 florins (approximately $460 million) on the arts, architecture, and charity. Pico, Ficino, Botticelli, Michelangelo, Leonardo, Raphael, and others would never have been able to birth their extraordinary gifts without Lorenzo protecting the gestation of their talents from the difficult aggressions of the world. Yet, Lorenzo didn’t shield them from the harsher realities. Because of his losses, he wanted the full paradox of life to inform their work. One of the most compelling functions of community is to let the fullness of life, harshness and all, shape our sensibilities while protecting each other from the difficult aggressions that surround us. At its best, community serves as a trellis on which the delicate flowers of humanity can grow and blossom. We’re always capable of both, of destroying the world out of vengeance and creating a new world out of loss. 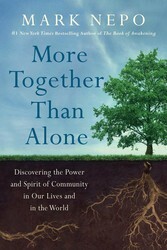 Editor’s Note: For more about the powerful impact of community on our lives and the world, pick up a copy of MORE TOGETHER THAN ALONE by Mark Nepo. Related: When we work together, anything is possible. Here are 5 easy ways you can help save the planet. Excerpted from More Together Than Alone by Mark Nepo. Copyright © 2018 by Mark Nepo. Used by permission of the publisher. All rights reserved. Mark Nepo is the author of twenty books, including Seven Thousand Ways to Listen, The Endless Practice, and the #1 New York Times bestseller, The Book of Awakening. Mark traveled the country with Oprah Winfrey on her sold-out 2014 “The Life You Want” tour and has appeared several times with Oprah on her Super Soul Sunday program (OWN TV). Visit him online at MarkNepo.com and ThreeIntentions.com.